Gypsy style also known as bohemian style has been a long going trend that will probably never die. There is something special about the fun, free spirited jewelry that crosses many generations. Let's take a look at the different types of jewelry that the Gypsy Style incorporates. Braided or woven styled necklaces, bracelets and anklets that are made with or without beads or stones are a staple in the gypsy style jewelry trend. You will find these jewelry items made from braided or woven cord, hemp or leather in a variety of styles and colors. When it comes to earrings in the gypsy style, look for long dangling earrings in the chandelier style for the classic gypsy look. Today you can also opt for the dangling feather style for the more modern look. Wooden jewelry is also popular with this style. You can find pretty light-weight wooden dangle earrings, wide and thin bangle bracelets, and big and bold wooden pendants. What a throwback to the 60's and still fun to wear. Overall Gypsy jewelry tends to be made from a variety of materials like bone, feathers, cording, braided leather, hemp and other natural fibers. 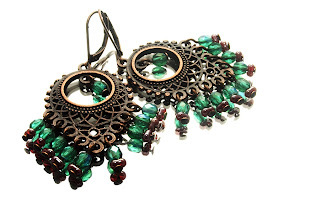 However, you can find gypsy style jewelry made with semi-precious metals too, although die-hard gypsy style lovers will tell you to stick with the natural or mostly natural materials. You will also find that many of the pendants on necklaces in the gypsy style are made with semi-precious gemstones that have a symbolic meaning. ie. clear crystals which are usually quartz inspire healing, etc. Finding your style in the gypsy jewelry trend is easy when it comes to many of these great finds in your local boutiques or from online shops. Have a bit of fun with your style once in a while and let loose!